This guide provides information on the Accelerator but assumes a sound understanding of the Data Vault modelling approach. The Accelerator provides a quick-start opportunity with a best effort, technical modelling of Data Vault constructs out of the source metadata. It is configurable and provides a preview that can be rerun as many times as necessary so that the initial Data Vault modelling can be completed faster than through manual metadata modelling. It is important to remember that the Data Vault modelling approach is based around Core Business Concepts (CBC) that are built upon Enterprise Wide Business Keys (EWBK) to allow for intra-systems integrations. The Accelerator does it’s best to derive this from the source metadata but there is a need for a modeler with enterprise knowledge to translate the data and events into a source system agnostic model. The Accelerator makes it easy to get started and iterate through variations so that the analysts and subject matter experts can validate and tune the model to best match business processes. The starting point for the examples in this document is when all source metadata has been imported for the AdventureWorks LT database, the Source to Staging and Persistent Staging has been completed and it is time to start integrating the staged data into the Raw Data Vault. Follow the guide for Source To Staging and import all SalesLT tables from the AdventureWorksLT source. Before starting the integration and acceleration of the technical artefacts, it is important to have an understanding of the expected target model and how the data from the source model can be loaded into this target. The source model is defined by the source. In most cases, the source model is not directly transposable to the target model so some analysis and modelling are required. The technical implementation in the source is then tweaked to match the expected Data Vault model. Once the target model is drafted, compare the accelerated metadata with the expected outcome and tweak accordingly. This guide builds on the other guides in the series and assumes that the environment has been set up and configured, source metadata has been imported and that the source to staging process has been modelled and completed. 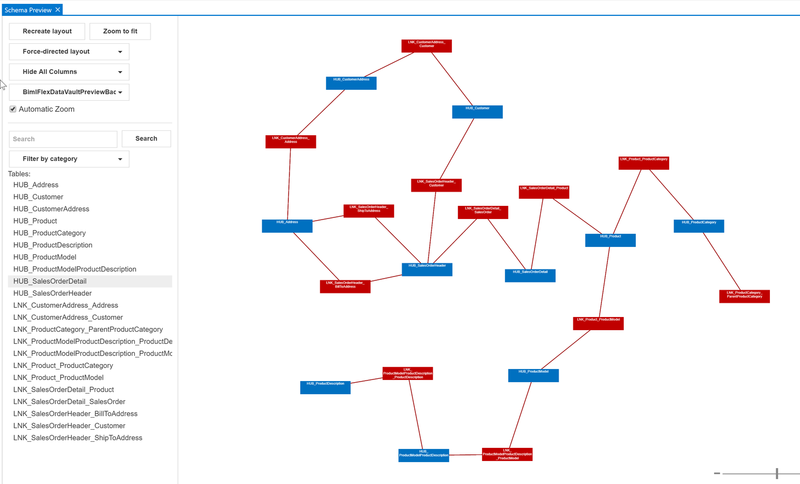 The workflow uses BimlFlex Excel and BimlStudio with BimlFlex to model and manage all metadata. The data can be pushed and updated from both Excel and BimlStudio. Describes events and transactions through the relations between the Core Business Concepts. The accelerator will use the metadata in the source for the project to derive the potential Hubs, Links and Satellites. The derived Data Vault model is available to preview and refine through editing the metadata and updating the preview. The workflow where metadata is updated and tweaked and reprocessed through the Accelerator into the Data Vault preview allows a rapid design cycle of the Raw Data Vault. 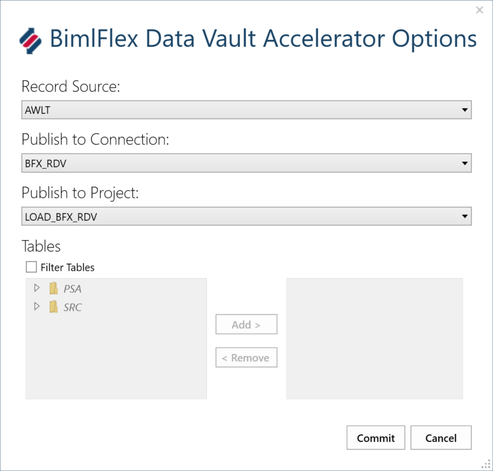 Should the Accelerator not be needed it is possible to manually define the Data Vault artefacts and generate out the full model through the normal BimlFlex process. This is described in more detail in the guide for Raw and Business Data Vault. Once the Accelerator preview matches the model expectations the metadata can be published to the repository and become part of the normal metadata set. The following narrative will guide us through the Accelerator process end to end. It is part of the overall BimlFlex workflow described earlier. run the metadata import for the source system if not done already. This import identifies source tables as a base for either Hubs, Links or Satellites. 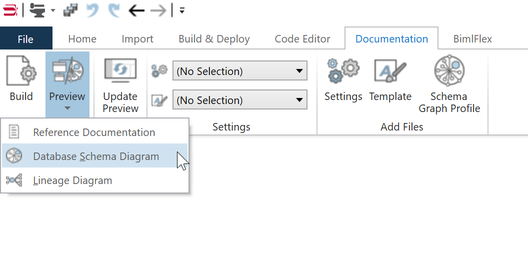 preview the Accelerator through the table list in the solution explorer. The Accelerator is integrated into the BimlFlex Ribbon on the BimlFlex tab in BimlStudio. Once the required base information is available for the Accelerator it can be configured and previewed directly in BimlStudio. In the preview, it is also possible to filter the tables used for the preview from the source. This is useful where the full set of source tables have been included but the Data Vault is built piece by piece. Starting to source and persist changes from the source without having to consider the Data Vault process means the Staging part of the solution can be completed sooner. Constraining the Data Vault Acceleration to a subset allows for a more agile delivery where valuable parts of the solution can be put to good use as soon as they are done. Once the Preview Options are defined and committed it is possible to Preview the Data Vault model. The preview will generate the destination table artefacts in the solution explorer to the right in BimlStudio. Once the preview objects are available it is possible to review the information in the list of tables. 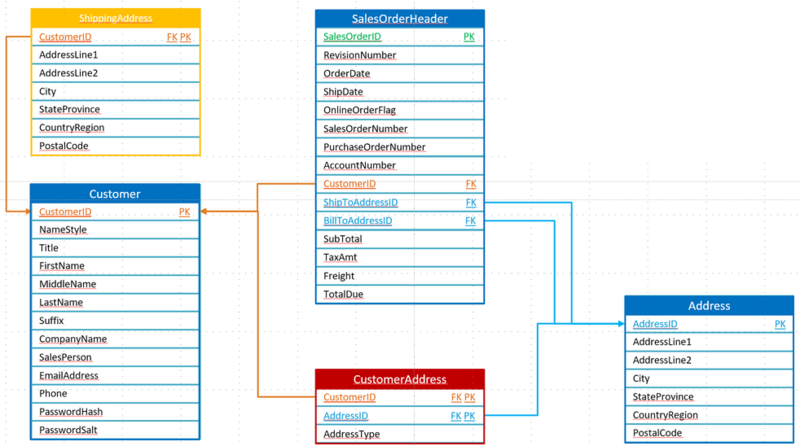 It is also possible to generate a Database Schema Diagram that details the tables and their relationships in an easy to review diagram. The default schema will include all tables from all stages/layers. By filtering the diagram to only include the Hubs and Links by choosing the BimlFlexDataVaultPreviewBackbone in the filtering pane a user can review the CBC’s and UOW’s. Anything that needs tweaking, can be updated in the metadata which will, in turn, produce a new schema from the updated information. Iterating through the metadata and updating the model to better support the target Data Vault model, each time a user should set the updated metadata to be persisted to the Metadata Database. This will create all Data Vault tables and columns as well as the Source To Target mappings needed to populate the Data Vault from the chosen source. If there is a need to update the model and rerun the preview, it can be done at any time. Once the metadata from the preview has been published, all metadata will be available in the Excel metadata editor and available for direct manipulation there. 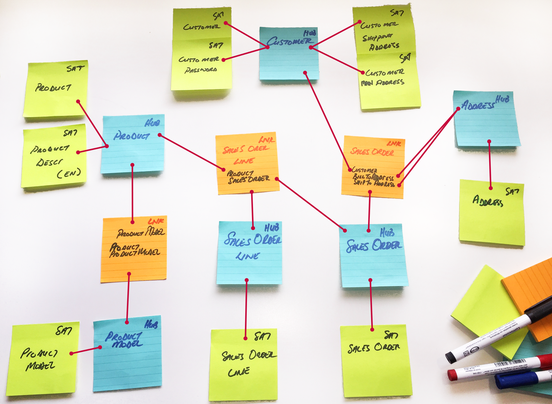 The pattern of tweaking the Metadata to fit the business process and target model will be repeated however many times needed before publishing. Note that the accelerator will not resurface any entities already accelerated and marked as excluded or deleted. To see these entites, include them in the project by removing the excluded/deleted flag. There are a set of rules applied through the Accelerator to make it perform what it does. The first rule applied is using the source metadata to derive the Table type. By using relationships defined in the source and imported through the source metadata import a user can run the following table logic. Every table with no incoming foreign keys and only one outgoing foreign key with all the referencing columns also primary key columns and no other columns are part of the primary key is a candidate to become a Satellite source table. Every table with no incoming foreign keys and more than one outgoing foreign key with all the referencing columns also primary key columns is a candidate to become a Link source table. Tables that don't fit any of the categories above are going to be Hub source tables. If the source doesn’t have relationships defined, such as flat files, these needs to be added to the metadata for the Accelerator to derive the table types. All acceleration uses default naming conventions so basic names for Hubs and Satellites will be derived automatically according to the configuration. The first Acceleration step is to accelerate tables defined as Satellites. It will look for the defined business key and use it as the Surrogate Key for the connection to the Hub. Once the Key to use is defined and added as the hashed surrogate key the rest of the columns in the Satellite table are added as Satellite attributes. It is possible to use the ModelGrouping metadata feature to split the source table data and group information into separate Satellites. This is useful for when part of the data in the source table changes more frequently. The ModelGrouping name will be added to the end of the Satellite name and the data from the source will go into this separate Satellite as well as the main Satellite. 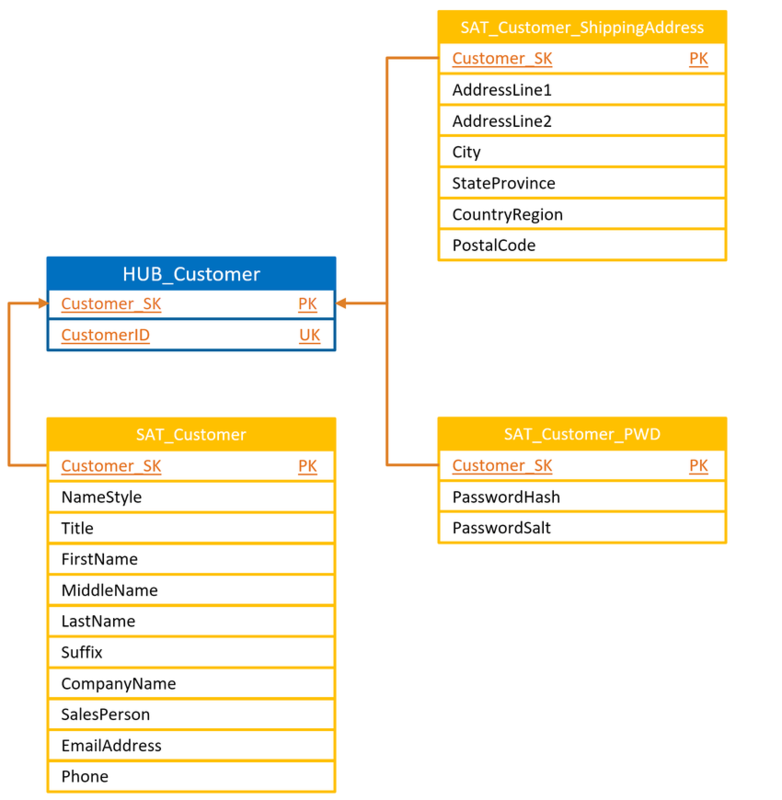 The sample above shows how the Customer and ShippingAddress source tables are Accelerated into a HUB_Customer and three separate Satellites, one of them by adding PWD to the ModelGrouping for the password columns. The Link tables in Data Vault are many to many relationship tables. 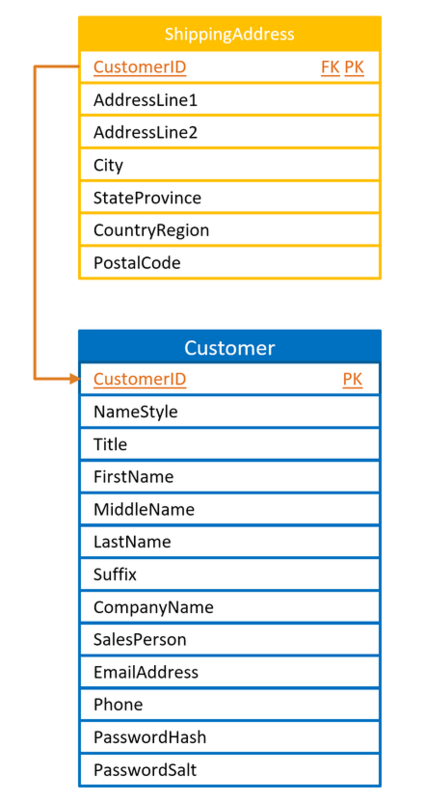 Instead of having one-way foreign keys in the entities the relationship between entities is defined in a separate table. The tables identified as Links by the Accelerator will be similar. They already have the relationships between the source tables defined and technical keys to the surrounding tables. The Foreign Keys will be translated into Surrogate Keys linking to the respective Hubs. All created Links will have an effectiveness Link Satellite added. Any attributes left in the source Link Table will be added to the default Link Satellite. They can be separated out into their own Satellites if needed using the ModelGrouping override. It’s worth noting that if there are source system applied rules for relationships (such as a product can only be in one category) they will need to be specified as Driving Keys in the Accelerated Link unless the Accelerator can derive the behavior from relationship constraints. For Hub tables that have Foreign Key relationships defined the Accelerator will generate Links for each Foreign Key between the defined Business Keys. These Links will need to be reviewed as the UOW they describe might not align with the business process. Any remaining tables and Business Keys will be used to create Hubs. The defined Business Key for the table will be used for the Hub Attribute and this attribute will be hashed into the Hub Surrogate Key. The UOW defines the granularity of the relationship between the entities. It is vital that the granularity is correct and that it properly describes the business process a user is interested in. 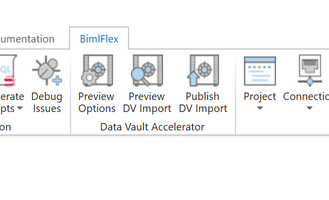 The columns in BimlFlex Excel that start with Model are used only by the Data Vault Accelerator. By updating the metadata with model information, a user can drive the behaviour of the Accelerator to generate the Data Vault model needed. This column contains the actual table name to be used as after the solution is modelled. This column contains the short name to be used for Links and Link Satellites after the solution is modelled. A Link between GeneralLedger and ChartOfAccounts will use the default name [LNK_GeneralLedger_ChartOfAccounts]. Defining the value GL_COA here will generate the name [LNK_GL_COA] providing easy naming flexibility through metadata when modelling more complex relationships. Interpreted when importing metadata from source and can be overridden after additional analysis. The rules defined above uses the keys and relationships to derive Hub, Link or Satellite as the type. Please note that this attribute is only relevant when using BimlFlex to generate a Raw Data Vault model. This is used to define the business attribute name. While the same column names are used in source to staging to persistent staging, it is usually advisable to use actual business process aligned names in the Data Vault. This attribute is used to group columns and split them into separate Satellites and to group columns defining a Unit of Work for Links. This attribute is used to define the Link and Link Satellite concatenated table name. It is required when multiple table references exist on the source table. An example would be the SalesOrderLine source table where the ShippingAddress and BillingAddress both reference the Address table. Two relationships will be created with the ModelReference forming part of the name. This attribute is autogenerated when importing metadata and can be overridden. Once the metadata has been modelled and the preview represents the target model a user will then publish the metadata to the metadata repository. By clicking the Publish DV Import the new data will be committed to the Metadata database and made available in BimlFlex Excel. Once the Metadata is published it is possible to update the metadata, getting all entities, in BimlFlex Excel to review the new objects and columns now available for further modelling. 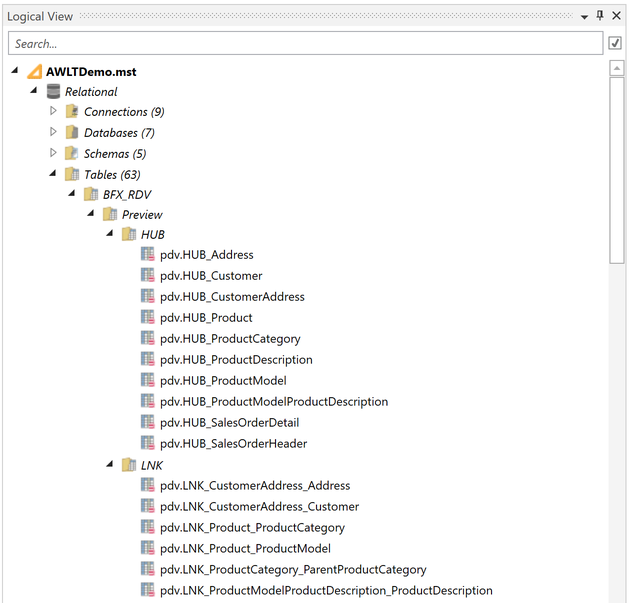 Once reviewed in BimlFlex Excel Add-in it is possible to generate all Tables and database structures as well as SSIS packages based on the Accelerated metadata from within BimlStudio.